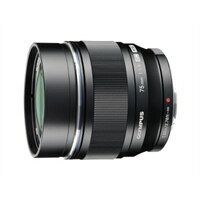 This high-grade fast aperture portrait lens features metallic construction and a light weight. With a 35 mm equivalent focal length of 150 mm, it is suitable for studio portraits, theater stage and indoor sports photography. A large bright 50 mm front lens element compliments a sophisticated optical design of 10 individual lens elements in 9 groups, including a total of 3 ED lenses and 2 HR lenses. Clear and sharp image quality starts from its largest f1.8 aperture, and a 9-blade aperture unit produces beautiful circular defocusing. MSC (Movie and Still Compatible) AF drive assures fast and nearly silent focusing. Lens elements feature Olympus' ZERO (Zuiko Extra-low Reflection Optical) coating technology. Close focusing down to 29.5 inches is possible.